1. Preheat the grill. Mix together the flour, baking powder, garlic, chives and a pinch of salt. Make a well in the centre and add the yogurt. Bring together to make a soft dough, kneading briefly until smooth. 2. Lightly dust a work surface with flour. Shape the dough into 8 balls and roll each one out to 5mm thickness. Grill the breads for 2–3 minutes on each side until golden with darker spots. Spread with a little butter and serve warm. 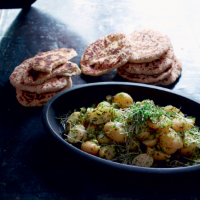 For an attractive bar-marked finish, try cooking the flatbreads in a ridged griddle pan. Serve as a buffet of Boxing Day salads alongside Herbed Tabbouleh With Tahini Yogurt Dressing and Simple Warm Potato Salad.